The Women’s Business Development Center held its 29th Annual Entrepreneurial Woman’s Conference on Sept. 2nd at McCormick Place-West in Chicago with Reshma Saujani, founder and CEO of Girls Who Code, a national non-profit organization working to close the gender gap in technology, who served as keynote speaker at the conference. In Saujani’s speech, she said that young women need to consider careers in STEM (science, technology, engineering and math) fields. “There’s no question than technology spurs innovation and has the ability to transform our workforce,” Saujani said. “To leave women out of this growth is really, really shameful.” Saujani continued that schools need to “invite female entrepreneurs and female coders into our classrooms” to share their stories and get girls excited about technology fields. Girls Who Code anticipates introducing some 10,000 girls nationwide to computer programming by the end of 2015. Designed to augment the growth of women-owned businesses, the conference offered attendees a business trade fair and connect women with corporate and government buyers. 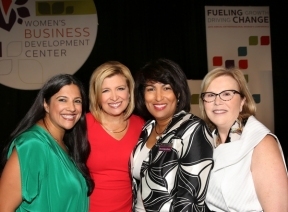 Reshma Saujani, founder, Girls Who Code (left), keynote speaker at the 29th Annual Entrepreneurial Woman’s Conference at Chicago’s McCormick Place-West on September 2, is pictured with Allison Rosati, NBC5 anchor; Debra Jennings-Johnson, BP America, and board chair of the Women’s Business Development Center (WBDC), and Emilia DiMenco, WBDC president and CEO.